Multitude Project: Why do we need a contribution accounting system? First, we need to make a distinction between a contribution accounting system and an exchange system. Suppose that we have 3 individuals picking cherries using one basket. 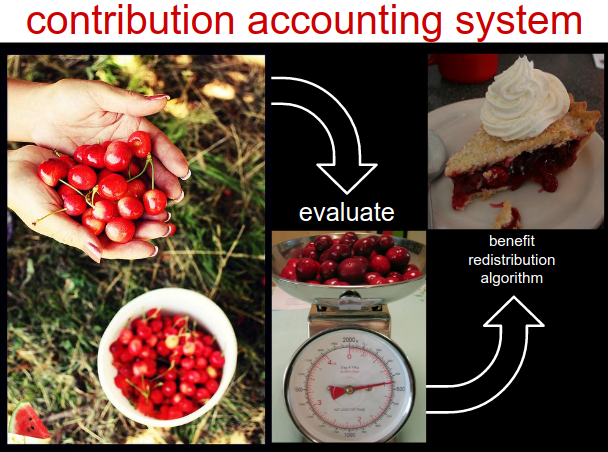 The contribution accounting system keeps track of how many cherries everyone puts in the basket, so that when they sell the basket on the market they can decide to redistribute the revenue in proportion to everyone's contribution. It describes how contributions from multiple individuals amalgamate into a product, during a co-production processes. Once a product is created, i.e. once the basket is full and ready to go to market, it can be exchanged using an exchange system: barter, currency, etc. The contribution accounting system is not a currency, not a barter system. It doesn't refer to an exchange between our 3 individuals who are picking cherries, or between them and another entity like a company. They are not getting paid a salary in exchange of their work. They are collaborating, they all add cherries into the same basket, which is their product to be. The exchange might occur at a later point in time, once their basket is full and ready to go to the market. Meanwhile, they all share the risk of having their cherries being eaten by birds, or of not getting a good price for their basket. stigmergic coordination- Participants don't have aligned goals, don't maintain a relationship other than being contributors to the same process. Ex. this is how Wikipedia is built. cooperation - The goals of participants are not necessarily aligned. Ex. in a corporation employees and business owners usually have divergent interests and goals. collaboration - Requires a large degree of alignment in goals. Ex. a group of individuals climbing a mountain together. The traditional capitalist economy is mostly about cooperation, which doesn't require an tight alignment of interests and goals. Production is sustained through an exchange process, where workers exchange the time they spend on different tasks against wages. The exchange process transfers risk from workers to the owners of capital, but at the same time, the workers are stripped of their rights to the output of their labor. Workers cooperate (despite some inconveniences and misalignment in interests and goals) with the owners of capital in production processes because there exists an economic dependency between the two groups. Workers need money, which are by far the predominant means to acquire basic necessities. On the other side, the owners of capital need labor to generate more wealth. This economic dependency is not symmetrical and makes the system prone to abuse, which explains the existence (and necessity) of unions to counterbalance the tendency for exploitation. In peer production we have a blend of the 3 arrangements mentioned above, mostly coordination and some stigmergic collaboration. In general, no one works for anyone else. Everyone involved is a peer, an affiliate of a peer production network. The p2p culture prescribes that the output of a collaborative and participatory process should not be owned or controlled by anyone in particular, but shared among participants in a fair way. Immaterial artifacts that are produced in such way (such as software or hardware designs) are usually released as commons (they are openly shared). Material goods can be exchanged on the market, and the revenue generated is shared among all the participants. Service-based models also exist, where services are exchanged on the market against some form of payment, which is redistributed to everyone involved in the providing the service. A good example of service-bases p2p model is the Bitcoin network. If we focus only on the mining aspect, minors form a open network of peer participants, they collectively maintain the hardware infrastructure of the entire network. Minors are rewarded in proportion to the computing power that they provide to the network. In the traditional capitalist economy wages should be regulated by the free labor market, if we make abstraction of all sorts of mechanisms through which this market can be biased (labor unions and governmental intervention included). The market is responsible for the difference in salary between an engineer and a clerk. The notion of job implies that a salary is determined and agreed upon before the employee starts working (with the possibility modify the salary based on performance). Since the amount of $ per hours of work is pre-established, the capital owner needs to make sure that the employee produces enough during the work hours. Therefore, a new role is needed within the organization to guarantee this, the beloved project manager. Traditional organizations spend a lot of energy doing time management, because usually the interest of the worker is not perfectly aligned with the interest of the capital owner (see cooperative production above). Classical organizations operate on the normal mode of production (from the ''normal curve'' or ''bell curve''), where the number of workers is minimized, and the majority of employees in a category of roles produce almost the same amount. Very few workers produce less than the norm, because they are eliminated (i.e. fired). Very few produce more, because there are no incentives to do so, the association with the mission of the traditional enterprise is weak, the sense of belonging is usually low (usually fabricated by the HR department), the sense of ownership is almost absent, etc. The situation is very different in a peer production environment, which is open to participation, is decentralized in terms of allocation of resources, and uses a horizontal governance system. In peer production, we see a log tail distribution of contributions, which means that a very large number of individuals are involved in production, only a very small percentage of those contribute a lot, the great majority of them contribute very little, and most of the production is done by those who make small contributions. A prearrangement on revenue is impossible in this context. First, because the production process is very dynamic and relations of production cannot be contract-based. Second, the process involves a great number of individuals that are distributed all over the planet, therefore it is impossible to do time management. Moreover, no one can force anyone else to work more. In this mode of production we need to evaluate rewards after the fact, based on deliverables or based on the type of activity and its potential to increase the probability of production of valuable products. A system is needed to account for everyone's contribution, to evaluate these contributions and turn them into rewards.We call this an access to benefits algorithm. In some sense, the access to benefits algorithm is a distributed solution to time management, which can be applied to large scale and very dynamic peer production processes. It embodies positive and negative incentives, and can contain parameters to influence individual participation and quality of contributions, it can regulate behavior, it gamifies production. For example, a reputation system can be tied to the access to benefits algorithm: a higher reputation results in a higher reward, all other things being equal, and vice versa. Moreover, it can also contain parameters to incentivise periodic and frequent contributions, and to prioritize important processes. The long tail mode of production needs a contribution accounting system in order to allow fair redistribution of rewards. It allows participants to record contributions of various types and it uses an access to benefits algorithm to turn them into benefits. But this is only the first part of the story. In the OVN model contributions are attributed to the creation of resources, which can be documents, designs, parts or full prototypes, etc. (some contributions go into infrastructure of community development and they lack clear resource or deliverables). From the resource level, contributions aggregate at the project level. A project is an open venture, or a business unit. It is the smallest unit within the OVN that can generate all sorts of benefits, including revenue. The fact that contributions can be attributed directly to resources (not projects) is very important for commons-based peer production (CBPP), which builds on open source. On Github, pieces of open source software (OSS) can be picked up by someone and remixed into something else. Open source hardware (OSHW) development follows the same path, i.e. designs (mechanical, electronic, optical) are forked and remixed. This ability to fork and remix parts of more complex systems makes open source development a very efficient process. This explains why modularity and interoperability are very important properties of OSS and OSHW. If rewards are envisioned for the work done, CBPP needs to find a way to account for contributions at the resource level and to track the way resources are put together in different contexts (projects are considered contexts). If contributions are only recorded at the project level, projects become silos of economic activity with a reduced possibility of benefits flows between them. Taking into consideration the structure of OSS development, the solution to the benefit/reward redistribution problem is to attach some information to individual resources created that allows their reevaluation later, when they get remixed and integrated into larger systems, in other contexts. The metrics of evaluation can vary depending on the context. This is the role of the network resource planning system NRP, which allows benefits/rewards to propagate upwards through value streams and the creation of a single resource can generate rewards from many different sources (many projects), depending on how many successful projects are using it. This goes even further, because this same NRP also provides a growth mechanism for CBPP networks. To illustrate this, imagine that members of a CBPP community decide to attribute equity to resources that are created by other communities. (Example: SENSORICA decides to integrate a piece of open source hardware developed by another OSHW community). First, why would SENSORICA affiliates decide to diminish their revenue by giving equity to other groups when they can just copy the open source design? The economic rationale is to reduce efforts required to internalize new capacity (new knowledge and know how around that piece of open hardware) and to increase the speed of execution (a first to market advantage). CBPP networks grow by affiliation. By offering equity to other CBPP communities they are essentially building bridges to innovate faster and improve production processes. This is the higher-level structure of networks-of-networks (see the Open Alliance). We believe that in order to sustain the CBPP we need to create infrastructure that allows attribution of value-related properties to individual resources, to allow reevaluation of these individual resources in context, and to facilitate the formation of networks-of-networks that preserve the individuality of every community part of it, but at the same time brings them together on the same economic platform. As the economy transitions to a networked state, existing organizations are trying to adapt. We already see traditional corporations going from in-house R&D, to outsourcing R&D and more recently to crowdsourcing R&D. This movement is forced by the need to innovate fast, and by the fact that open source lowers the price to a point where traditional high-tech corporations can be put out of business. Crowdsourcing R&D means utilizing all sorts of schemes to attract the participation of the crowd into innovation processes that are sponsored by these corporations. In early crowdsourcing practices corporations tried to control the innovation by signing non-disclosure agreements with the participants. Crowdsourcing platforms were created to match corporate projects with skilled individuals. The practice was competitive, i.e. the company would chose a winner among different proposals, and usually the winner was rewarded with money. This practice gradually became more open, since the first iteration of crowdsourcing platforms were not very successful in attracting highly skilled individuals. In order to attract innovation, in order to grow open innovation communities around them, corporations need to think seriously about the reward mechanisms they put in place. It is not so difficult to understand why the early crowdfunding platforms were not very good attractors. I would not compete in a call by a company to design something for a few bucks, with a good probability of losing the race, knowing that the company will monopolize the work and probably make a lot of profits on it. The trend is to go from closed crowdsourcing to truly open source innovation, which must be accompanied by a broadening of the reward system. Since companies are going to deal with the crowd more and more, they need a contribution accounting system to account for contributions. See this presentation by SENSORICA making the distinction between competitive crowdsourcing and collaborative crowdsourcing. In parallel to the adaptation of traditional companies we also see the creation of hybrid organizations and models. For example, in the realm or hardware, we have the emergence of ecosystems like Arduino and 3D Robotics/DIY Drones. They are composed of a traditional for-profit organization surrounded by an open source community. This post describes the situation. The difference here is that in most cases the open source community pre-existed the traditional for-profit, the later being created to manufacture and to distribute the products that are based on the innovation created by the open community. These hybrid models, the ones that are sustainable and successful, maintain an precarious equilibrium between the profit motive that can arise within the centralized traditional organization the open and sharing culture within the open innovation community. In some cases, this equilibrium is not maintained and the synergy between the two entities disappears, destroying the ecosystem. This was the case of Makerbot and the RepRap community, well captured in the Netflix documentary Print the Legend. NOTE to the authors: this text is also published on the P2PF Wiki. Modifications done here must be also done there. Thank you for your feedback! I fully agree with "stigmergic coordination", it is also an expression Michel Bauwens likes to use. I am less attracted by the term "traditional work". I implemented some changes based on your input. I've been struggling with "cooperation". I know that for a lot of people "cooperation" has a positive connotation. A different meaning arises from the following observation: "Totalitarian regimes don't work because they erode the cooperation of the population." This idea also implies that totalitarian regimes use different strategies to enhance cooperation, which further implies that behind what is generally perceived, there can be divergence of intentions and goals. In the end it's just a matter of terminology and I think we need a new term to distinguish between cooperation as in cooperatives and cooperation as in corporations. Cooperatives are more democratic by nature and their mission is to insure the well-being or at least the interests of the group. The corporation's main mission is to insure the interests of the owners of capital. These are two different settings and the relations of production within them are consequently also very different. The new term needed would make this distinction more explicit. Any other idea for a new term? Just do this: make it so no new money is released until a third party believes that they're contributing value. For example, in the United States, women should allow printing new money when the men are making valuable offers. Hi "average", your input tells me that you probably mix a "value accounting system" with a "value exchange system". I added an introduction to the text to eliminate that misunderstanding. I might be wrong in my interpretation of your input, and in that case I am sorry. But in my previous discussions with others this confusion came up many times, so your intervention reminded me to make this distinction right at the beginning. Thanks for your intervention. The capitalist measuring methods for value are still falsely typecast, as it were, from material and concrete, countable, discrete goods from accounting systems we inherit from an Italian friar tracking shipments and losses and loans against trade on dangerous roads, often for dangerous war supply routes. Generally accepted accounting methods shoehorn the value of intangibles at best. Now, intangibles are the lion's share of markets, and we can say that the market sets a default value for traded securities, but we can not assess the value of a company by its assets any longer -- pure fiction. What you describe here is a rather elegant phrasing of part of why, for some sectors. - Corporations (Taylorist ones, much less creativity-oriented ones) may spend money in time management, but don’t open organizations spend time in other things that corporations don`t (for example, logging contributions, evaluating reputations)? Doesn`t it even out in a way? - I agree that economic dependency is not asymmetrical in the corporate model, but are the really symmetrical in an OVN? For example, an individual can put a lot of money in a project, owning 60% of it, and the others do the work and share the rest. Don't corporate workers go beyond a mere economic dependency (e.g. Google)? Can't people be dependent economically of an OVN? Isn’t the VAS, in the end, regulated by the market? Wouldn’t a software engineer in demand check how much he could make at Microsoft (if he actually had chances to be employed there) before engaging in the OVN (perhaps using it to negotiate the parameters)? (I know there are other things beyond money in these decisions, but I suspect most people consider money as an important factor). Oh thats a great info provides by you about a accounting toowoomba i would like to thanks to share such type of great info.I want to continue with your blogs. hey nice information for us,and i really like your article of the Finance and best accounting services. Thank you! I have been search for all the blogs regarding Accounting System, I firmly said, yours is most informative and useful I ever read! I have created an implementation of this concept using Time Value Accounting principles in a free market using a smart price tag as a market exchange price setting mechanism. All contributions to The hOEP Project are counted as units of personalized time and attention in various categories such as reading, writing, voting, prize awards, etc. Hours of time spent waiting in line to purchase things can be spent as money and you can vote on decision making and allocation of resources by choosing which line to use at a grocery store. Prices in a free market Exchange can be specified in any number of time value accounting units of exchange. I would like your thoughts and feedback on the ideas in the hOEP Project. Your time spent with the hOEP project can be counted as investment credit and re-spent to buy goods and services. Your prizes and awards of time value for your contributions accrue if people read and vote for your contributions with their time and attention. To learn more try. . .
About your article, I like it and it's really insightful and explained lots of key terms and concepts that I've been deriving and considering independently. I've been writing on a lot of these topics from a different angle. I think the key distinction between what I propose in the hOEP project and the needs of the value accounting system discussed is that hOEP (hOurs Equals Price) distributed price setting technology works in the current free market exchange system at a profit and allows implementation of pear to pear price setting and distribution. So instead of looking at labor I've been looking at exchange and distribution on a pear to pear collaborative basis that includes labor value as a consideration in the price setting and distribution function. By using a hOEP tag, a seller could for example calculate the sale price based on a persons $/hr and charging in units of hours of personalized time at the cash register allows a price tag to determine the purchase power of labor dollars. For example a rich person who's time was worth $200/hr and had a high carbon footprint could be charged more money for the purchase of a good or service based on their $/hr and carbon footprint. By introducing into the economy an evolved price tag financial technology innovation, we can induce a marketplace evolution that results in any distribution and allocation of resource plan we want and do it at a profit. It would also be possible to create a price tag that charged more for owners of capital than for labor workers on an individual basis on individual purchases. If it made a seller a profit in some markets and some customers use it, then it becomes a custom or norm of usage determined by supply and demand for that particular formulae of exchange pricing in a free market. A seller might for example offer "socialist pricing tag" that charges everyone using a formulae base on their $/hr rate as if they are making the same amount of money on the job and with clever pricing the seller would make profit while implementing socialism with a price tag formulae in a free market.